White Strok is winter visitor in Gujarat. We saw them in good number in year of 2013-14 along with group of Openbill and Painted stork. But in year of 2014-15 we did not get chance to see them. We heard that White Strok is regular winter visitor at Pariyej Wetland. Before our visit my few college friends also visited Pariyej Wetland and they successfully locate White Strok. We decided to go Pariyej Wetland while coming back to our home from Vansada National Park. At Pariyej we met our birder friend Mr. Vimal Dubal, he informed us about nearby siting of White Strok. So we drop other plan and started our drive to suggested direction. In bright morning light we saw nine White Strok in cut-down paddy field. They all were busy in preening activity. They are using their head to take out oil and applied it to their feathers. Few of them are just resting in sunlight. The farm is situated just beside roadside, so its easy to observe their behaviour from footpath. Due to movement of some passing by farmers they all fly away. When we were planning for the Pariyej one of our birder friend Dr. Bhavesh Mengar send us location of White Strok for our help. So we plan to move at that Place. While going towards that place we saw 100 of Sarus Cranes in cut-down paddy field filled with water. We spend few hours with them and finally reach the place BM suggested. 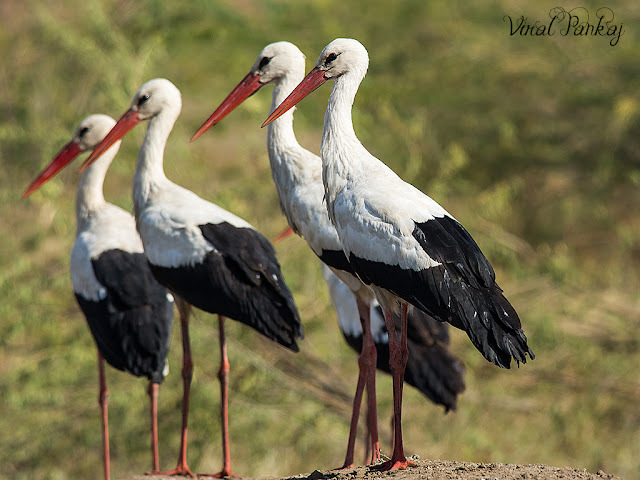 Again we found group of 7 White Strok along with one Painted stork. It was our first visit to Pariyej Wetland and what we get there is more than expectation. It is the White STORK, same as painted STORK ( which is spelled correctly!)......... pls change the spelling.